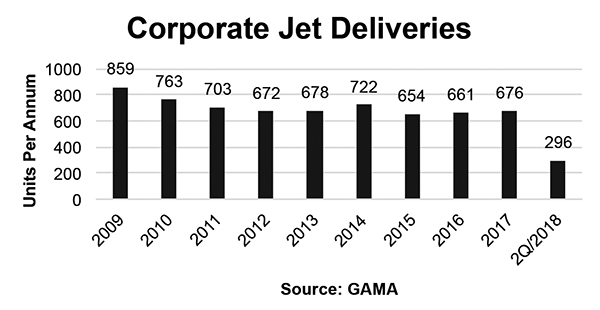 The lack of any improvement in the delivery rate for business jets in the first six months of 2018 compared to the same period a year should normally be a cause for concern but to some extent this is good for used pricing. In the past, the business jet manufacturers have sometimes preferred to discount prices to maintain production rates which have inevitably impacted used prices. As discounted new aircraft are delivered in numbers then the prices of used aircraft are adversely affected – and have been. But for the first six months of 2018 there were 296 business jet deliveries, exactly the same number as for the first six months of 2017. The apparent lack of change needs to be seen in the context of deliveries by HondaJet of its $5 million light jet. The limited number of new aircraft entering the market has the advantage of forcing buyers to the used market and limiting the number of trade-ins. Prices of used jets have managed to see a measure of stability with some actually increasing. Availability of large business jets has fallen to only 432 aircraft according to AMSTAT. This represents only 7.3 percent of the 5,914 large business jets in service of which more than half are located in North America and is nearly half the peak level of availability in percentage terms seen in 2008-2009. The average asking price of heavy business jets has risen by some ten percent in the last few months although this may be due to younger aircraft entering the market. The more limited number of large business jet aircraft on the market, albeit still taking some 200 days or more to sell, has clearly contributed to the greater confidence in the market. Yet this needs to be seen in the context of pricing having fallen by a considerable amount in recent years, sometimes by some fifty percent over a few short years. The arrival of new large business jets from Bombardier and Gulfstream may see an increase in delivery rates in the coming months. For the medium sized sector of the business jet market, the level of availability amounts to 695 aircraft or 9.2 percent of the 7,538 in service. This represents a slight improvement in recent months.